Welcome to Shiksha. Founded with the vision of endowing our children with education in the customs, practices and traditions of Hinduism, Shiksha aims to nourish them with the wealth of India’s Arts and Cultural heritage and instill in them a lifelong commitment to Hindu spiritual values; the values we cherish as parents and wish to pass on to our children. Children at Shiksha learn in the most serene and devotional environment of Radha Madhav Dham where traditional Gurukul style outdoor classes are mixed with modern indoor classes to provide fun-filled learning experience. 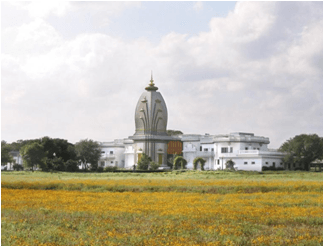 Established in 1990, Radha Madhav Dham is one of the largest Hindu temples in the U.S. It provides a rare opportunity to experience the devotional environment that prevailed in the ashrams of Vrindavan 500 years ago. The beautiful ashram, measuring over 200 acres, is a representation of the holy land of Braj in India where Shree Radha Rani and Krishna appeared 5,000 years ago. For more information, please visit the Radha Madhav Dham website.